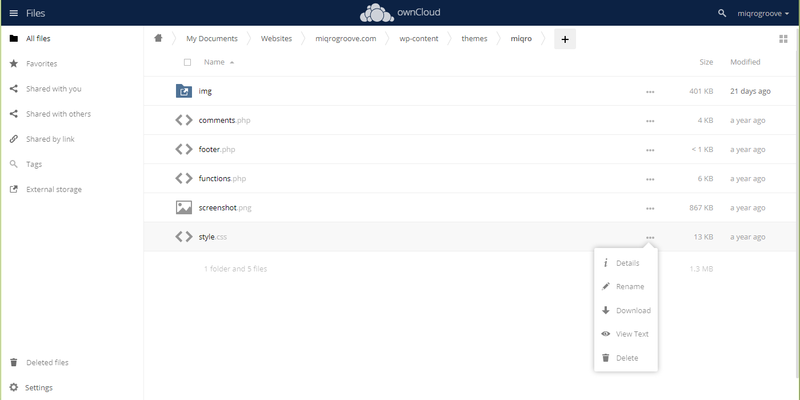 This is a little website tool I put together for ownCloud users. If you enjoy retrieving text files from your cloud server through your phone, it helps to be able to see the text in as few steps as possible. 1. 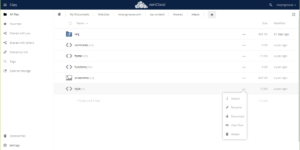 A context menu item provides one-click access to view the file in your browser without the awkward text editor app in the ownCloud website. 2. A text-only directory browser is also provided for situations where the infinite river of file listings takes forever to scroll through on a mobile device. The app is currently available at https://github.com/miqrogroove/files_textviewer/releases and I am working on adding it to the ownCloud Marketplace. Someone attempted a very noisy attack against my router’s built-in OpenVPN server today. While there was no chance this person could guess my encryption parameters to gain access, he or she did manage to cause a denial of service. We’ve increased Internet speeds in your area. 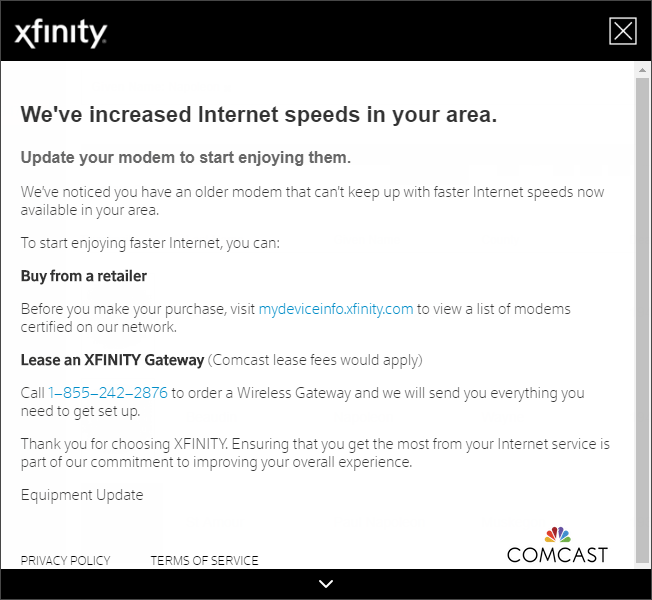 Update your modem to start enjoying them. We’ve noticed you have an older modem that can’t keep up with faster Internet speeds now available in your area. 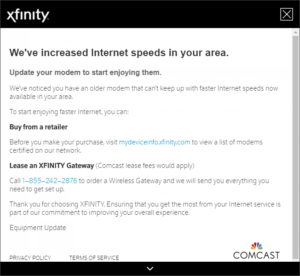 Before you make your purchase, visit mydeviceinfo.xfinity.com to view a list of modems certified on our network. Call 1–855–242–2876 to order a Wireless Gateway and we will send you everything you need to get set up. Thank you for choosing XFINITY. Ensuring that you get the most from your Internet service is part of our commitment to improving your overall experience. In the Chrome web browser, you can block this with the ComcastBlocker extension. The Xfinity script still loads, but its effects are minimized by removing all the display elements. I just resolved a long-term problem where one specific Windows 2012 server was unable to ping one specific device on the same LAN. There were no relevant resources or similar-looking cases on the web. Everything else on this LAN worked normally. The server could ping all other clients, and the clients could ping the server and the NVR. I just could not get the server to ping the NVR for the life of me. I suspected at one point that this was a routing issue due to my desire for strong security policies around IOT devices. This turned out not to be the case as I could find nothing wrong with the router or any routing tables. At last, I decided this problem was so specific that it could be a bug in the NVR itself. In this case, the only thing special about the Windows server from the NVR’s perspective was that the server was providing both DHCP and DNS to the NVR. I tried disabling each service, and found exactly what I was looking for. The NVR will not respond to pings from its DNS server. Disable the NVR’s DHCP client and set a static address with an alternative DNS server address value. In my case, the NVR does not need to use the local DNS server, so this is an easy fix. So long as my server’s IP address is not used in the NVR DNS configuration, everything works normally and the server can ping the NVR. While diagnosing what I thought was a Windows Update failure, I discovered unrelated massive resource consumption and file scanning activity apparently tied to the Start screen in Windows 2012. 10 to 20% constant CPU usage by Windows Explorer. Rapid file scanning or Shared Folder usage in the case of folder redirection. Resource consumption begins immediately after opening the Start screen and performing a keyboard search. Closing the Start screen does not help. Sign out the current user. This action will shut down Windows Explorer, preventing the unwanted symptoms until triggered again by a user. There is no such message ever issued by legitimate software. Instructions included with the file asking the user to “Enable content” should raise red flags and serious concerns about the file’s origin. A quick scan using an online virus checker confirmed this file is infected. Be careful out there. While installing Android Studio for the first time, I encountered the message below. Simply clicking the “Retry” button allowed the installation to continue successfully. Relevant log dump quoted below. Move it away manually and try again. Move it away manually and try again.. Preparing "Install Google Repository (revision: 54)". "Install Google Repository (revision: 54)" ready. Finishing "Install Google Repository (revision: 54)"
"Install Google Repository (revision: 54)" complete. "Install Google Repository (revision: 54)" finished. I just tried taking a Windows 10 laptop on the road for the first time. Everything was great until I tried the VPN for the first time. Suddenly, I was getting Access Denied errors, and “You do not have permissions” errors for all files made available offline. I confirmed the VPN tunnel and even browsed to other shared folders on the same server. The offline files errors persisted after dropping the VPN. When I returned to the domain Wi Fi, file synchronization completed normally and there were no errors at all. Am I to believe that Windows 10 is completely incompatible with VPN synchronization? I never had a problem with this on Windows XP, and I am dreading the months of research and experimentation normally involved in fixing this kind of Microsoft failure.